More than 100 people have protested outside a site where unmanned aerial vehicles (UAVs) are tested. Protesters from CND Cymru and other groups gathered at Parc Aberporth in Ceredigion and called for the end of military drone testing. It was planned to coincide with a vigil at the Excel Arms Trade Fair taking place in London. The Ministry of Defence (MoD) said the UAVs only flew at designated testing areas at Parc Aberporth. "We're trying to raise awareness that Wales is part of the war machine," said John Cox, chairman of CND Cymru. 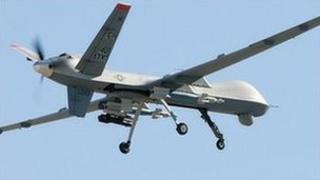 "Most people are unaware that Wales is part of the development of drones. "They don't have bombs on board but they are testing out drones here." QinetiQ, which works on UAVs, is one of a number of defence contractors working at Parc Aberporth. An MoD spokesperson said: "Watchkeeper, an unarmed Remotely Piloted Air System (RPAS), only flies at the designated testing area at Parc Aberporth. "Other UK RPAS aircraft, such as Reaper, only operate in Afghanistan under the legal authority of UN Security Council resolutions. "These aircraft have played a vital role supporting military operations and have saved the lives of countless UK and allied forces by providing essential Intelligence, Surveillance and Reconnaissance."